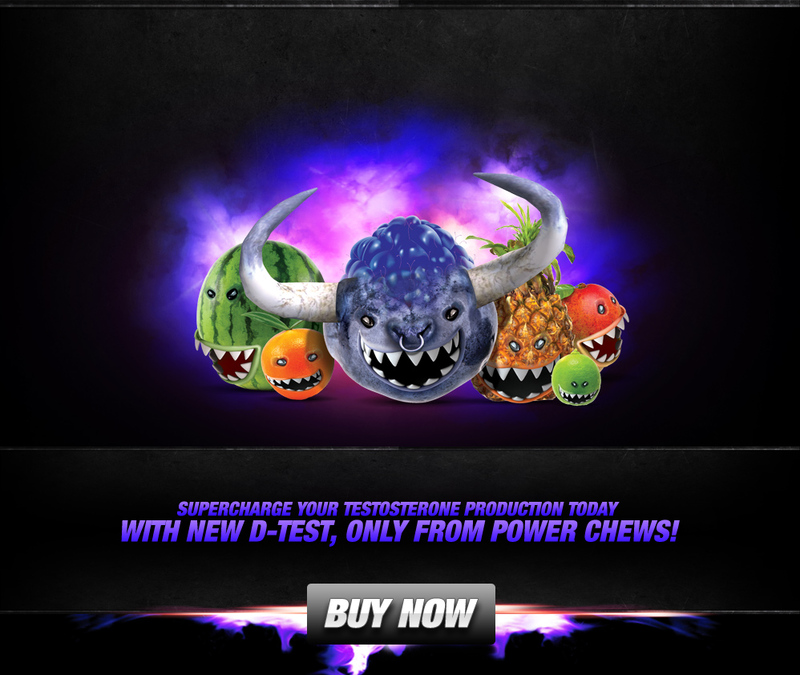 New Power Chews D-Test™ is a powerful pro-testosterone booster based on real clinical science. What’s inside are clinically validated ingredients in proven amounts to dramatically increase testosterone production, significantly reduce muscular damage, and rapidly increase androgen receptor density - creating the ultimate, naturally enhanced anabolic environment for the results you’re after. Every bottle of D-Test comes packed with 5 deviously delicious, sweet-tooth-satisfying, blow-your-mind flavors that taste out-of-this-world AMAZING! We're talking about flavors such as Watermelon Felon, Low Down Dirty Lime, the Mango Meanie, the Tropical Tag-Team Terror...the Sucker Punch Bunch - AND a brand new and exclusive flavor to D-Test, Wild Bull Berry. 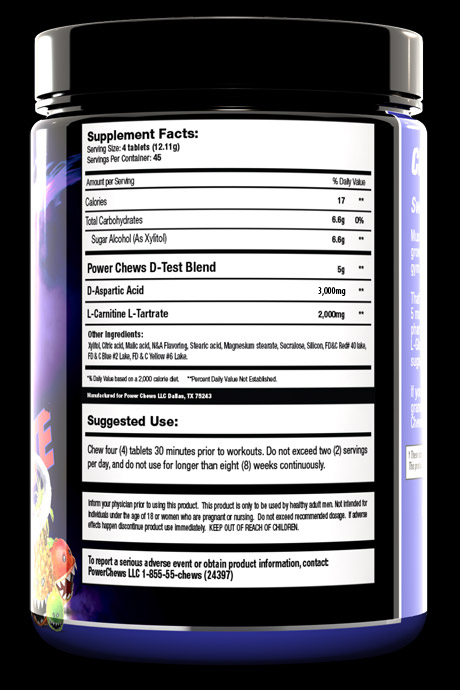 So how do we get our chewables to taste so good, you ask? 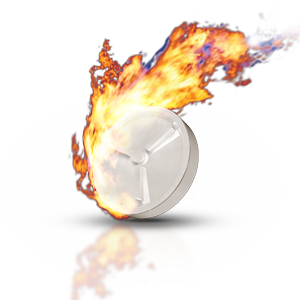 If you’ve tried chewables before, you probably remember them tasting chalky - and far from the taste advertised. That’s because traditional chewables use maltodextrin and cellulose to bind, which creates that chalky taste and texture. At Power Chews, we use Xylitol, which is not only healthy for your teeth, but creates a texture and consistency that's indistinguishable from sweet, mouth-watering candy. 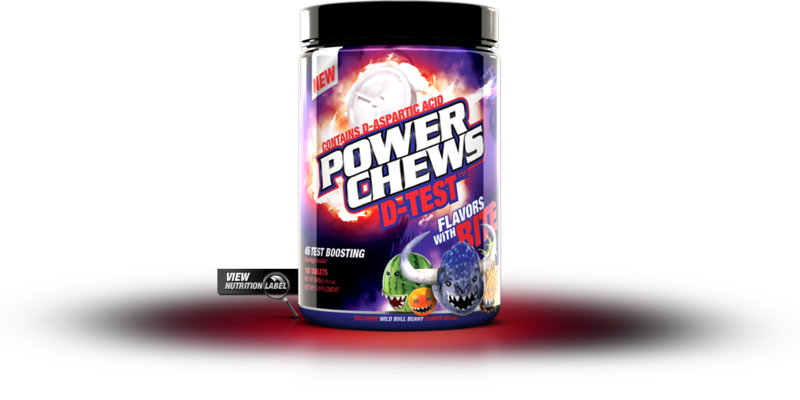 Power Chews, our goal with D-Test is to bring you a product with ingredients proven to work in real people - and not lab rats, guinea pigs, or petri dishes. Because your androgen receptors are what allows testosterone to go inside your muscles - they’re like the doors that need to be unlocked to open your muscles to newer, faster growth. And when those doors are unlocked and testosterone enters - BAM! Your muscular growth can FINALLY be cranked into overdrive.